We have not forgotten the Accordion Room project. 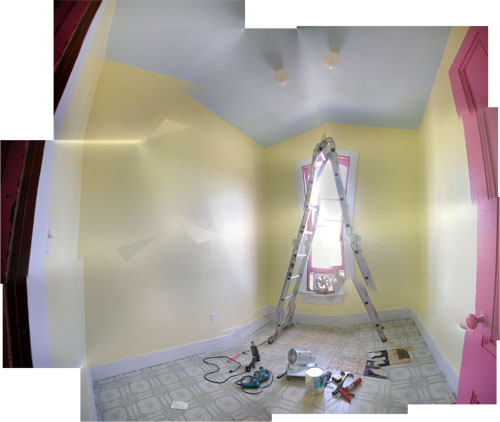 We spent some time and put a second coat of paint on the walls, and despite our being convinced, when we were finished, that they would need a third, the paint dried nice and solid and looks great. (The wet colour of the paint was a lot more streaky.) Let's hear it for Benjamin Moore. Only a lot less shimmery. We haven't painted the trim yet because we're about to do something that is really going to mess it up, which is to say the asbestos abatement. I spent a few days doing research and reading as much as I could about the subject, and this is what I decided on. Bear in mind that neither Noel nor I is a licensed anything or certified or trained. This is what we are doing in our own house, not a recommendation, all that stuff. Anyway. The recommendations seem to come down to keeping the possible asbestos fibers wrapped up in as many layers of plastic as possible. First we will remove everything from the room (obvious, because we're dealing with flooring). We're even going to have to remove the door because the flooring goes under it. We're going to tape plastic over the window, make a plastic antechamber in the hallway (little plastic room with a plastic floor and overlapping flap doors into the hallway and the room, all sealed off). To get into the room we go into the antechamber and dress up in bunny suits (disposable painting coveralls), also covering our hair and shoes. We put on gloves, goggles, and our HEPA filter masks, and we can go into the room. We will remove the flooring with a heat gun so it stays pliable rather than crumbling to bits. The debris will go in a plastic bag, sealed in a box, which will be sealed in another plastic bag labeled with the contents. If we need to leave the room, we go into the antechamber and remove the disposable clothes and throw them away. When we go back in we dress in a new set of disposables. When we are done removing the tiles, we will spray every surface, ourselves, and the box in plastic down with a soap/water mix. We will put our bunny suits and the gloves in plastic bag, bundled the plastic antechamber and other plastic materials up, then shove the lot in another plastic bag, also labeled with its contents. The debris will go to a landfill near here that will take this sort of stuff. So today I went shopping for the stuff we would need. We have the trash bags, gloves, goggles, filter masks, and heat guns. 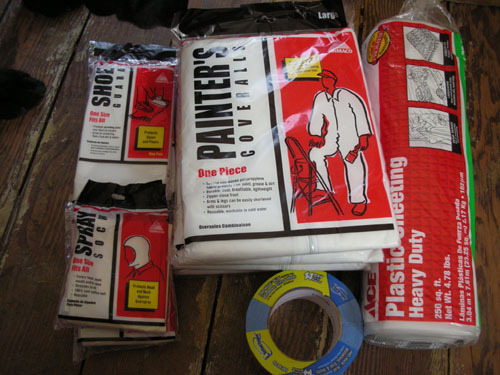 I got some tape (you can never have too much tape), plastic sheeting, and the components of bunny suits (coveralls, head covers, and shoe covers). If you imagine you are going to be spray painting you get the right idea of the amount of protection you need. Asbestos apparently cannot get through things, but you don't want little fibers hanging out in your hair or tromping around on your shoes. Bear in mind that we're dealing with the least-dangerous form of asbestos here. If we had, say, found a pipe insulated with asbestos or some other crazy setup, we would hire somebody to do this for us. Don't be a dummyhead. Wow! Good advice! Wishing you luck. We're still going to suit up entirely!